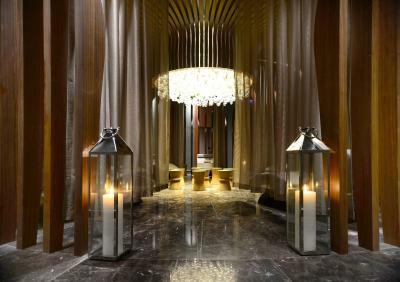 Lock in a great price for Wyndham Grand Istanbul Levent – rated 8.8 by recent guests! We live in Istanbul and spent one night at the Wyndham as a little in-city break. It far exceeded our expectations. Let me just say, it was the most comfortable bed we have slept in in our nearly five years living here. Granted, this night was a gift from our parents, so it was a higher class ($$) hotel than we normally stay at, but we were very impressed with the staff and facilities. The breakfast was phenomenal in its' variety of local fare and items for more Western palates. 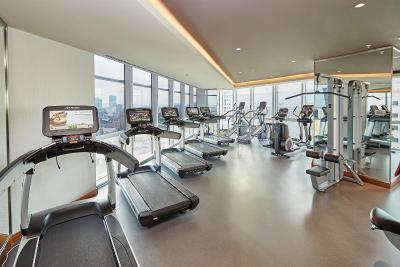 It is in a great location for getting around Istanbul as Levent is a metro and bus hub. I highly recommending this hotel. Well organized, cooperative stuff, clean rooms- super. 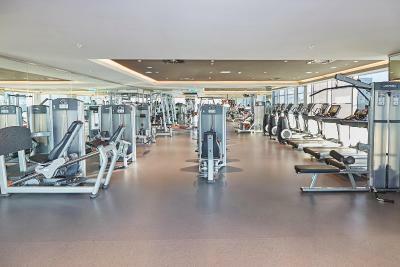 Very good location, facilities, services & staff! Excellent breakfast! i would like to thanks all recieption staff, they are very friendly and helpfully. i love the stay because of “wow” amazing services! 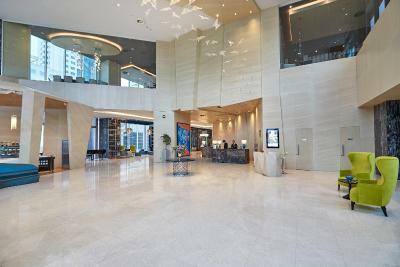 Wyndham Grand Istanbul Levent This rating is a reflection of how the property compares to the industry standard when it comes to price, facilities and services available. It's based on a self-evaluation by the property. Use this rating to help choose your stay! 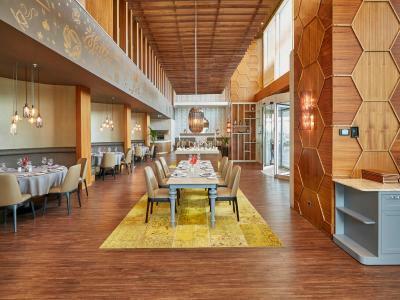 One of our top picks in Istanbul.Featuring luxurious interiors, Wyndham Grand Istanbul Levent is located on Buyukdere Road. 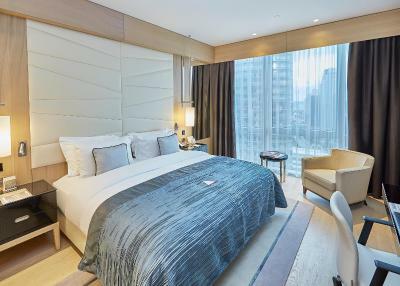 The hotel offers direct access to Levent Metro Station and numerous shopping malls including Ozdilek Park through underground connection. 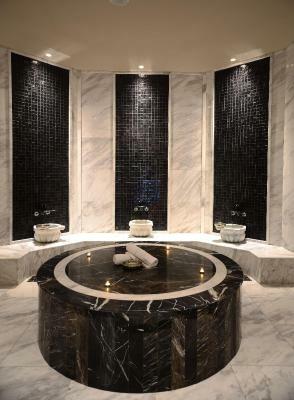 Guests can get a variety of health and beauty treatments at the 25919 ft² extensive spa, including an indoor and outdoor pool, gym, sauna, and a Turkish bath. Tastefully decorated with fine furnishings, guest room management system, each air-conditioned room offers 47” flat-screen TV with satellite channels. Free WiFi and wired internet, a mini-bar, safe box and a work desk are also provided. There is an electric kettle with tea and coffee setup in each room. Iron and ironing board are available in all rooms. Most rooms also offer city views. All exclusive and suite rooms boast turndown service. 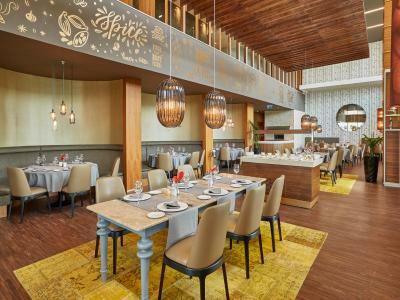 7 dining outlets including buffet and à la carte restaurant and a lounge are available. 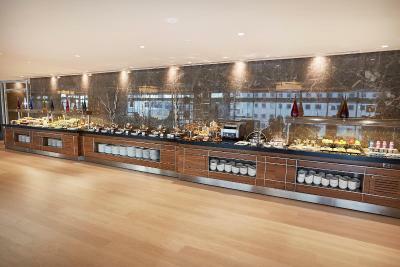 You can start the day with a rich breakfast buffet boasting a wide range of products. 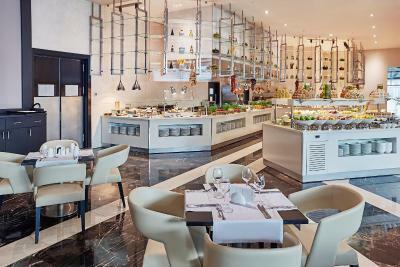 The Plaza 177 Restaurant and Caréme Restaurant serve international cuisine and Turkish dishes. 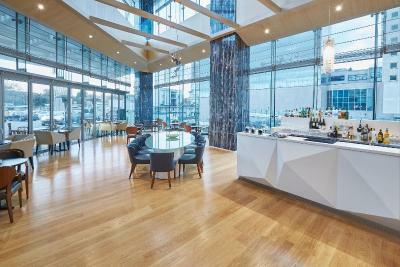 Guests can enjoy a drink at Vertice Cafe & Brasserie or at the breezy terrace of Carême Restaurant. 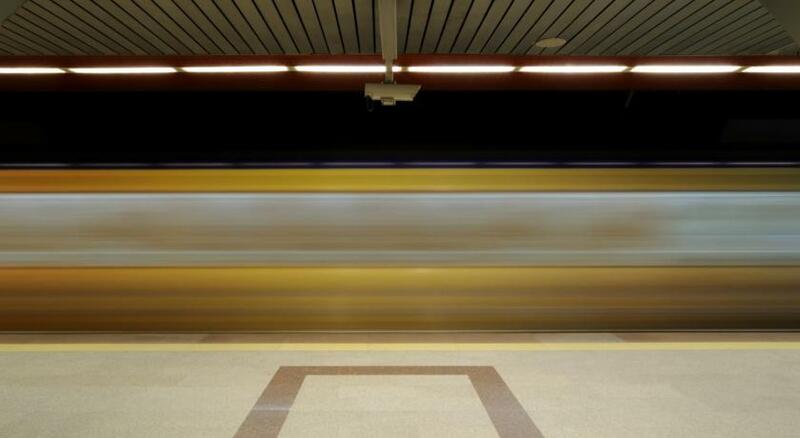 Taksim Square is just 4 stops away from Levent Metro Station. Metrocity and Kanyon shopping malls are within walking distance from Wyndham Grand Istanbul Levent and Istinye Park is within 3.1 mi. Ataturk Airport is 19 mi from the hotel. 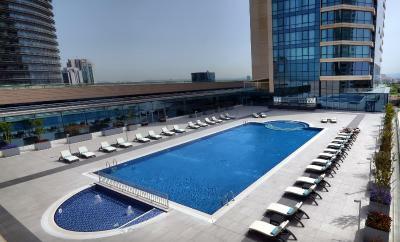 Istanbul Airport is 28 mi from Wyndham Grand Istanbul Levent. 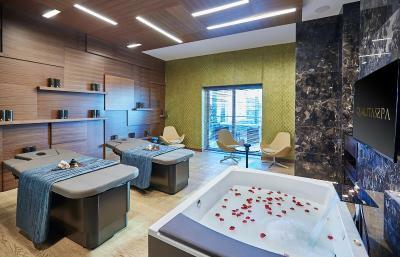 When would you like to stay at Wyndham Grand Istanbul Levent? On 9th or upper floors, this spacious room offers views of the historic city. It has a 47”LCD TV, high-speed wired internet connection, a work desk and tea/coffee-making facilities. This room also has ironing facilities, a safe and a minibar. 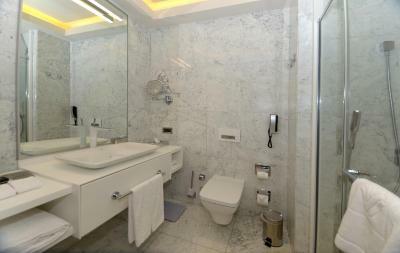 With modern décor, this spacious room is on 9th or upper floors and offers views of Marmara Sea. It has a 47”LCD TV, high-speed wired internet connection, a work desk and tea/coffee-making facilities. This room also has ironing facilities, a safe and a minibar. 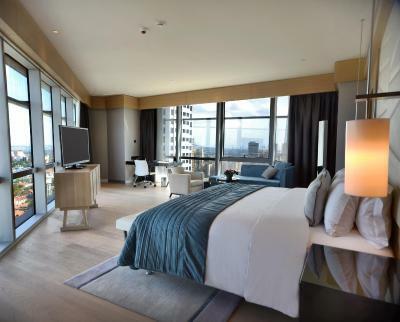 With a modern décor, this spacious room offers floor-to-ceiling windows with views of the historic city. It offers a 47”LCD TV, high speed wired internet connection, a work desk and tea/coffee making facilities. This room also has ironing facilities, a safe box and a mini-bar. 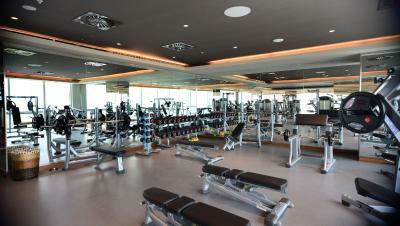 It also features free access the Executive Lounge, located on the 3rd floor, offering more customized services. Turndown service is also featured. With a modern décor, this spacious room offers floor-to-ceiling windows with view of the Marmara Sea. It offers a 47”LCD TV, high speed wired internet connection, a work desk and tea/coffee making facilities. This room also has ironing facilities, a safe box and a mini-bar. 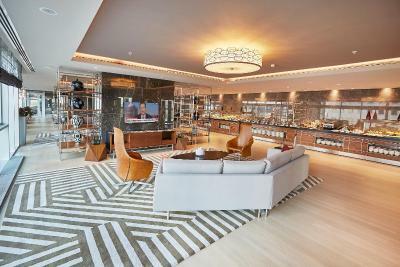 It also features free access the Executive Lounge, located on the 3rd floor, offering more customized services. Turndown service is also featured. 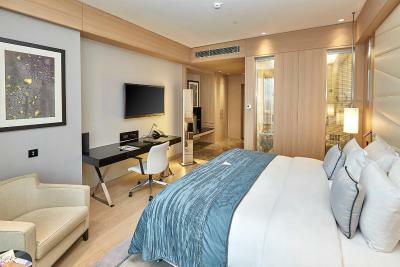 This suite offers a bedroom and a lounge. There is a 47” LCD TV, each for the bedroom and the lounge. The suite has high speed wired internet connection, a work desk and tea/coffee making facilities. This room also has ironing facilities, a safe box and a mini-bar. Turndown service is also featured. This suite offers a bedroom and a seating area. There is a 47” LCD TV in the bedroom. The suite has high speed wired internet connection, a work desk and tea/coffee making facilities. Ironing facilities, a safe box and a mini-bar are available. There is also a spa bath and a TV in the private bathroom. Turndown service is also featured. It also features free access the Executive Lounge, located on the 3rd floor, offering more customized services. This triple room has a soundproofing, mini-bar and bathrobe. 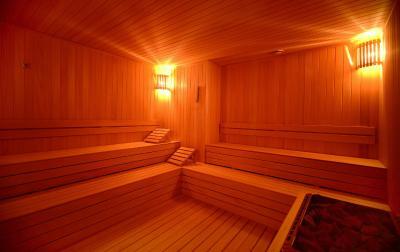 This room type comes with a queen bed and a roll-away bed or 2 single beds and a roll-away bed. Please note that the type of bedding depends on availability. This triple room features a view, bathrobe and soundproofing. This triple room has air conditioning, bathrobe and mini-bar. Turndown service is also featured. This room type comes with a queen bed and a roll-away bed or 2 single beds and a roll-away bed. Please note that the type of bedding depends on availability. It also features free access the Executive Lounge, located on the 3rd floor, offering more customized services. This triple room features a soundproofing, electric kettle and mini-bar. Turndown service is also featured. It also features free access the Executive Lounge, located on the 3rd floor, offering more customized services. This suite features a mini-bar, flat-screen TV and bathrobe. Turndown service is also featured. 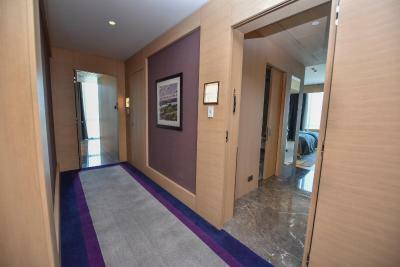 This suite has a soundproofing, executive lounge access and mini-bar. 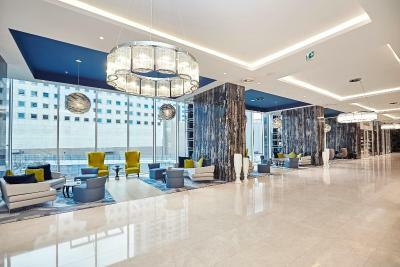 Wyndham Grand Istanbul located on Levent where the heart of business district in the city is. 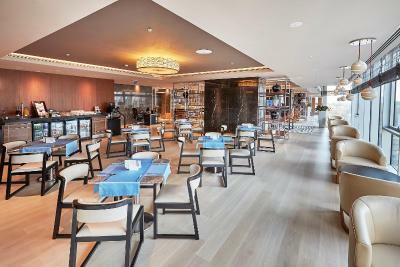 The hotel offers you to enjoy the fantastic view of Istanbul and location advantage of being close to numerous shopping malls and restaurants. 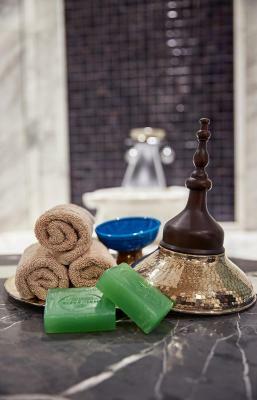 House Rules Wyndham Grand Istanbul Levent takes special requests – add in the next step! Wyndham Grand Istanbul Levent accepts these cards and reserves the right to temporarily hold an amount prior to arrival. Removing items from the mini-bar is subject to an extra charge of EUR 10. Breakfast was great! Beds are very comfortable! Design of rooms is fabulous! Pet (dog) was allowed to get in unleashed!